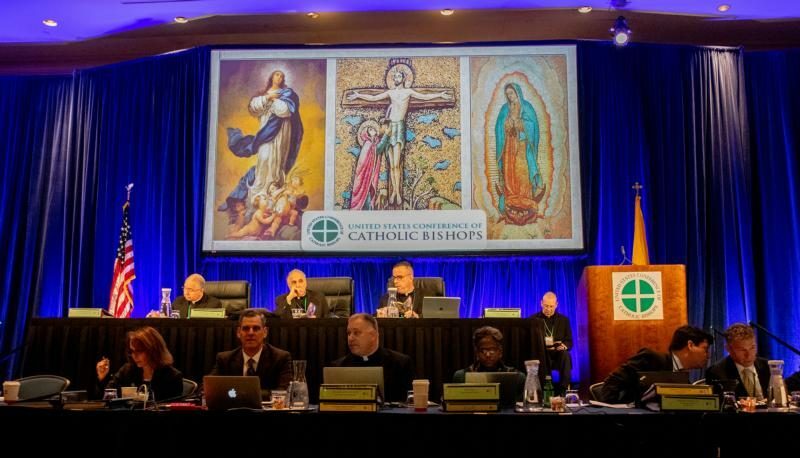 BALTIMORE (CNS) — The U.S. bishops, who gathered for a time of prayer at the start of their annual fall meeting in Baltimore, were urged by Catholic women church leaders Nov. 12 to be courageous and work with each other and the laity to move forward from this moment when the church is reeling from abuse allegations. The speakers were Christian Lamas, executive director of the National Federation for Catholic Youth Ministry, and Sister Teresa Maya, a member of the Sisters of Charity of the Incarnate Word and past president of the Leadership Conference of Women Religious. They told the bishops to remember their calling and not shirk their duties to help the suffering church. “The eyes of every victim of abuse in the church. and indeed, the whole world will now observe,” how you respond, said Sister Maya. She addressed the bishops as brothers and “hermanos” and told them she knew it took courage for all of them to even attend this gathering. “As difficult as coming to this meeting was, as contradictory as your opinions are, you must become one,” she said, encouraging them to listen to one another and then listen and rely on those in the church at large. She told the bishops the “church is bleeding and we need more than a Band-aid,” saying it needs its leaders to be transparent while also listening, providing genuine pastoral care and investing church funds for outreach. Lamas said she knows the bishops “didn’t sign up to deal with the church sexual abuse crisis — yet here we are.” She urged them to name the root of the problem, which she said was the misuse of power, and to look to laity to help them rebuild. Women religious also have something to offer the bishops in this current crisis, Sister Maya said, saying they have learned from how they have been tried and tested in recent years and experienced misunderstanding, controversy and a loss of their own sense of accomplishment. We learned, she said, that the only way to face any crisis is together, as sisters. “Brother bishops, ‘hermanos obispos,’ may you act with the urgency and the integrity that will give us hope,” she pleaded.